I was born and brought up in South Shields. Studied the piano and music theory with the late Dora Bell. Worked as pianist to Hardy Scholol Of Dancing in South Shields. Was organist to the Missions to Seamen South Shields. I worked, as a Peripatetic Pianist from the age of 17, for two years, with South tyneside education Authority (1974 -76). I moved to Pickering North Yorkshire in 1976. Am accompanist for various choirs. Go into the local Junior School twice weekly. I have been teaching the piano and music theory since 1985, on a one-to-one basis. Taught a group of adults music theory in the 1990s. Some students have entered for piano exams. Giving whoever desires to learn, the opportunity (whether young or old). The emphasis being on learning for the purpose of "enjoying" making music on one's own and with others. 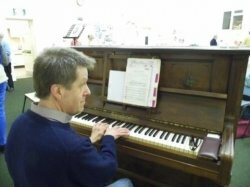 ChrisFrom Melanie (4/5): I was very apprehensive about starting to learn the piano late in life but Chris' friendly manner soon put me at ease. I am really enjoying the lessons and find the structure and pace perfect for me. Reply from: Chris: I appreciate the encouraging feedback Melanie has left. She is great to teach because there is manifestation of self motivation and enjoyment of the subject. I ALWAYS make sure the lessons are social in character (time to chat about things in general) as well as learning content). I AM MUCH ENCOURAGED BY THE FEEDBACK (ESPECIALLY AS MELANIE IS MY FIRST PUPIL WITH "FIRST TUTORS").